Bua den Scoth!! A Fantastic Victory!! 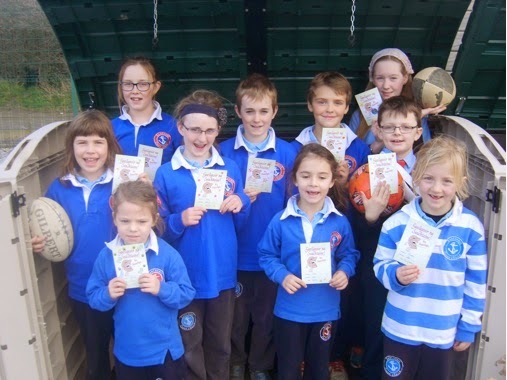 Comhghairdeachas ó chroí le foireann caide na scoile a bhuaigh Corn Uí Éalaithe i gcomórtas Sciath na Scol inné. 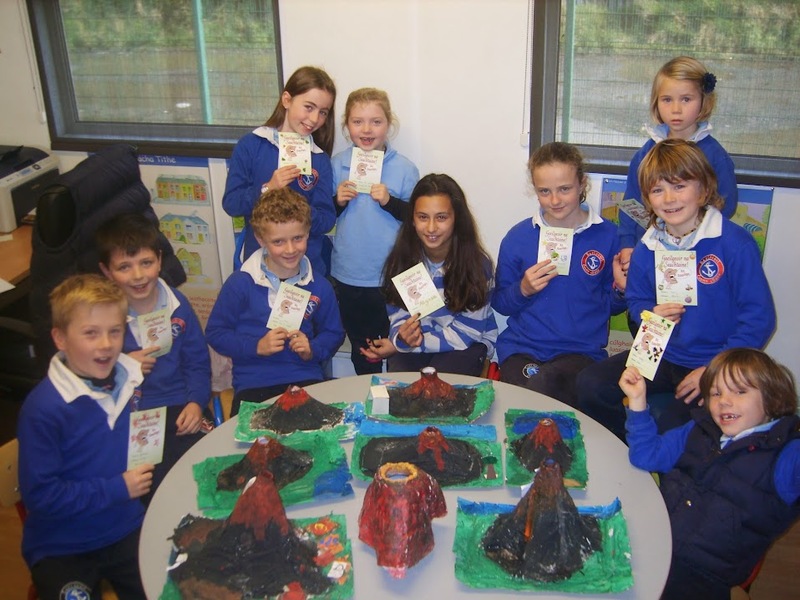 Lá stairiúil do Ghaelscoil Chionn tSáile a bhí gceist. Ní dhéanfar dearúd ar ró-thapaidh!! Ba mhaith liom an deis seo a thógaint mo bhuíochas a ghabháil le Múinteoirí Ciara agus Siobhán Ní Núnáin a bhí i mbun traenáil caide le blianta anuas. Mo bhuíochas leis do mhúinteoir Aodán atá ag cabhrú amach i mbliana. Bhuaigh sé an corn mar dhalta agus inné mar thraenáilí. Mo bhuíochas leis le tuismitheoirí na scoile a thugann tacaíocht duinn i gconaí , cabhrú le traenáil , síobanna a thabhairt ó am go chéile srl. Ba fiú an obair ar fad! Bhí mé chomh bródúil as gach pháiste a bhí linn inné! Maith sibh. Le cúnamh Dé beidh i bhfad níos nó laethanta mar sin againn amach anseo! A huge congratulations to the school football team that brought home the Healy Cup yesterday!. It was a historical day for our little Gaelscoil and it won't be forgotten in a hurry. I would like to take this opportunity to thank Múinteoirí Ciara and Siobhán Ní Núnáin for training the school team down through the years. I would also like to thank múinteoir Aodán for his help this year , yesterday was a special day for Aodán as he won the cup as a child and now he has been part of winning it as a trainer. The parents of this school are always such a fantastic help when it comes to sport. You have helped us with training , by providing a mode of transport to matches , by washing the jerseys etc. All the hard work paid off yesterday. I could not have been more proud of every since child that was in Páirc Uí Rinn yesterday. Here is to many more days out like that! Feel free to e-mail photographs of the day to Hilda in the office. We will make sure to put them up on the site. Beidh an Aifreann Clárú don Cóineartú ar siúl tráthnóna Dé Sathairn seo chugainn 8/11/14 ar a 6.30i.n. sa séipéal. The Confirmation Enrollment Mass will take place this coming Saturday evening 8/11/14 in the church at 6.30pm. Táimíd ag lorg sonóg don chluiche cheannais ar an gCéadaoin 05/11/14. Má tá teidí agaibh sa bhaile atá oiriúnach don phost, tabhair isteach é ar an gCéadaoin agus roghneoimíd ceann ar maidin 05/11/14! 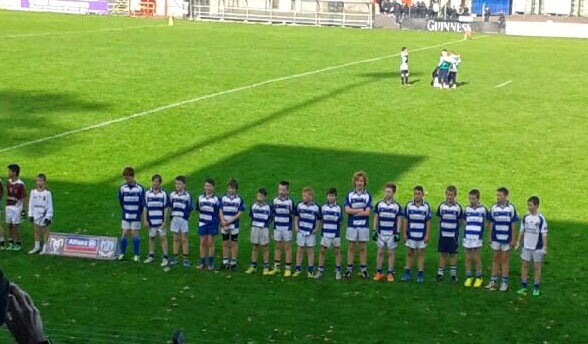 We are searching for a lucky mascot to represent Gaelscoil Chionn tSáile at this Wednesday's football final 05/11/14. If you think you have the teddy that ticks all the (blue and white) boxes, please send it in this Wednesday 05/11/14 and we will select the best one that morning to bring to the match! Beidh ranganna a 3- 6 buachaillí agus cailíní ag dul chuig an chluiche cheannais ar an gCéadaoin seo, 05/11/14, chun tacaíocht a thabhairt. Foireann: Bus ag fágaint ag a 10.00. Ar ais ar scoil ag a 1.45. Beidh ar gach imreoir €5.00 a íoc chun praghas an bhus a chlúdú. Tá bhur gcead isteach saor in aisce. Lucht Tacaíochta (páistí) : Bus ag fágaint ag a 10.30. Ar ais ar scoil ag a 1.45. Beidh costas €7.00 an pháiste á bháiliú ag gach múinteoir chun cead isteach agus praghas an bhus a chlúdú. Tá cead agaibh éide spóirt na scoile a chaitheamh ar an lá agus bratacha srl. beaga a thabhairt libh. 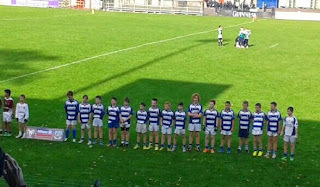 3rd-6th class boys and girls will be supporting the boys' football team this Wednesday 05/11/14 in Páirc Uí Rinn at 12.00. Team: Leaving the school at 10.00am. Returning to school at 1.45. You will need to contribute €5 towards the price of the bus. Players' entry is free. Supporters (students 3rd-6th class): Leaving school at 10.30am on a bus. Returning to school at 1.45pm. Each student must pay €7 to cover the price of entry and bus. Please send in payment on the 04/11 and the 05/11 to the class teacher. Students can wear their sports clothes and are allowed to bring small flags etc. to show their support. 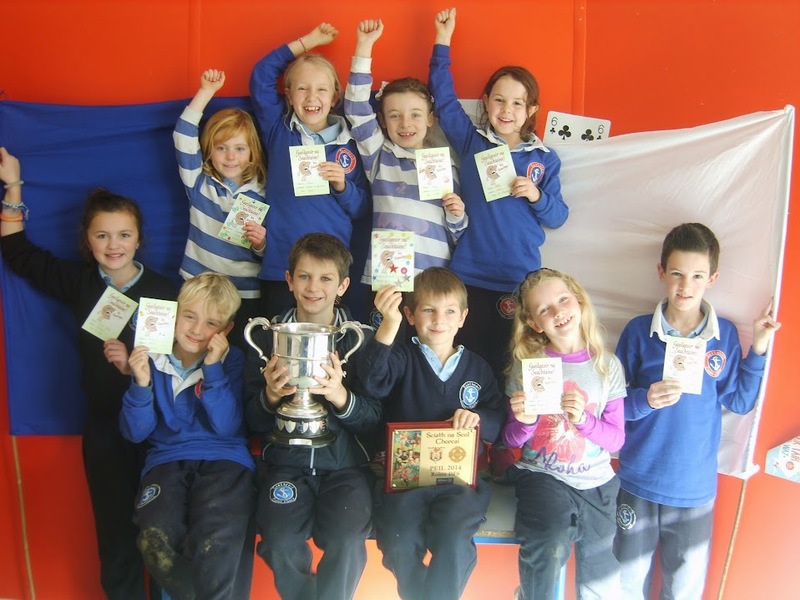 Cuireadh ar an eolas mé inniu (03.11.2014) go bhfuil cás míoltóga ghruaige sa scoil (Rang 1) . Scrúdaigh gruaig do pháiste anocht agus cuir an leigheas cuí air más gá. Tá sé an-dheacair fáilt réidh le míoltóga ghruaige muna bhféachann gach clann ar gruaig a bpáistí féin.Táim ag impí oraibh seo a dhéanamh chun cosc a chur ar an fhadhb go tapaidh. I have been informed today (13.11.2014) of a case of head lice in the school today - 1 st Class . Please check your child's hair tonight and treat it if necessary. It is very hard to get rid of head lice if each family does not look at their own children's heads. I am imploring you to do this to stop the problem quickly. Táimid ag cur tús le íocaíochtaí ar line do thuismitheoirí le haghaidh billí scoile. Chun é seo a chur i bhfeidhm tá seoladh ríomhost ag teastáil uainn ó gach clann. Beidh an teolas a bhaineann leis an tíocaíocht seo a thosnú á sheoladh againn chughaibh tríd an seoladh ríomhphost seo. Mar sin seol ríomhphost chuig na scoile agus scríobh d'ainm i bhosca an t-ábhar le bhur dtola. We are going to start on-line payments for parents. To set this up we need an email from every family. Information about payments will be sent to this email address that you provide. So please send an email to the school and write your name in the subject box to get the process up and running. le Anthony nó gan pairt a ghlacadh in aon chor. 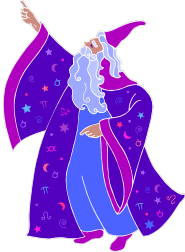 Anthony tomorrow Monday the 3rd of November instead of on Wednesday. easy / opt out of training with Anthony.